Wine Review: 2010 Hickory Creek Dry Rose | Wine Splash! Wine Dox Daisy gives this wine 5 Paws out of 5! We get so excited when we find a local Michigan wine that we really enjoy! And this one goes into our books as one of our favorites! The 2010 Hickory Creek Dry Rose from Buchanan in Southwest Michigan. We had read about it being released so we immediately decided to make a visit and give it a try. On sight, the color of the wine was a very bright pink but leading into a clear light red. More deep red than most rose wines we have seen and it was very appealing to us! On the nose, fresh strawberry, raspberry, and a slight hint of spiciness. On the palate, it was medium to full bodied in weight, soft, but very mouthwatering! Flavors of ripe strawberry, citrus, and raspberry. On the finish, flavors of watermelon and a hint of herb came through on the mid palate. The wine was dry but very refreshing and fruity! This wine would pair well with ham, chicken or pork with a fruit glaze, medium cheeses, or a fresh summer salad. We really enjoyed this wine and bought a few bottles when we were visiting Southwest Michigan. We may need to head back soon since we feel we may run out! On our SiNoTas scale, we give the 2010 Hickory Creek Dry Rose an A. (92 points on the regular scale). For us, the flavors were just right. Fresh, fruity, approachable, and refreshing. 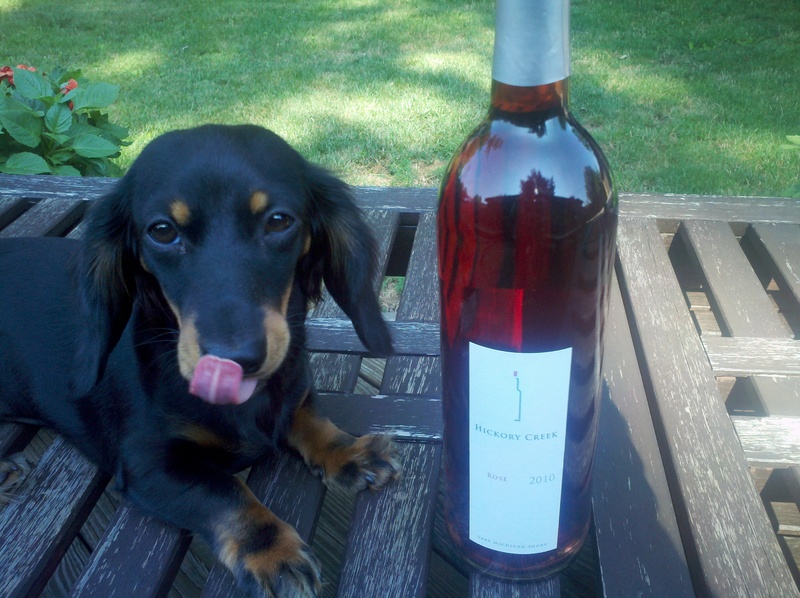 Our Wine Dox Daisy gives this wine 5 Paws out of 5 and she knows her wines! If you purchase a 2010 vintage, we feel it will be wonderful for the next 2 years until 2014. But who can wait that long?! WineSplashing! !